Since content marketing has become the foundation for many online marketing strategies, countless companies have adopted webinars as a primary tactic for entering the online content game. Webinars are a great way to reach out to your audience and share your expertise, be more visible online, and provide thought leadership on a regular basis. If executed properly, they can offer clear and specific value for prospective customers and ease them down the sales funnel. Timing of the presentation: We are all busy, and how many of your audience members are likely to be free during the presentation? Time… in general: I would love to sit down and soak in hours of valuable webinar footage each day, but we all know that’s not realistic. Webinars eat up your most valuable resource: minutes in a day. Engagement: Webinars are essentially online meetings with a PowerPoint deck, and such meetings have a deserved reputation for being long, dry, and dull. We simply sit through them to absorb information. To address these issues, consider offering highly condensed versions of your webinars in video blog form. There is a great, untapped opportunity to repurpose those 30- to 60-minute webinars into more digestible online content pieces — with minimal cost and effort. I’d argue this is a secret weapon — a tactic that many companies haven’t yet caught on to. We all skim websites nowadays — our attention spans are short. Shorter is better for busy professionals. My theory: Busy = Successful = Valuable Clients. Footage of a person talking directly to you can be more engaging than a slide presentation. They can work for you on the SEO side, as the videos can be keyword optimized, meta-tagged, transcribed, etc. They are cheap to produce. Videos are perfect for visitors who are unfamiliar with how webinars work. Videos add personality and humanize your brand. 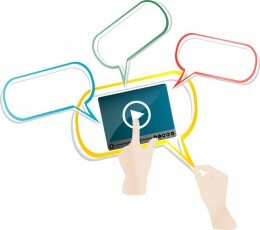 A short video is a mobile/social media friendly format. Creating this type of video is fairly straightforward. Follow these five steps and you’ll be ready to create online content that will help you connect with even your busiest customers and prospects. Be aware that creating this format of video involves different skill sets — and some additional hardware — than hosting a webinar. But also note that you do not need to create a high-production masterpiece in order to achieve your content marketing goals with online video content. If you have a camera (just pull out your phone and you’ll see that you likely do), then you probably have all the equipment you need to get started. Basic: This is the “mobile phone camera” approach. Although not always suitable, basic production is useful to simply recap what your audience missed — and this level of quality is perfectly acceptable for sharing your knowledge in social media. Think of this approach as serving up your most important insights to your followers on a silver platter. Advanced: Typically this high level of production is used when you are doing a company overview for your home page or another high-visibility brand content product — i.e., when you want to highlight your company’s insight in the best light possible. For this type of effort, you’ll likely want to hire video professionals, plan out your strategy, and make sure it is consistent with your other brand image materials like your website, your business cards, etc. Intermediate (somewhere in between basic and advanced): There is a pretty wide range of options between basic and advanced level production quality; for example, DSLR/still cameras can shoot amazing HD video, and with a small investment in a basic lighting setup and microphone, you can produce content that holds its own even in the world of premium online video. The internet is a great place to research all these and you just may have some or all of the talent in your organization right now to pull this off. People really like lists. I like to group points into a list of 3, 5, 7, 10 or 20. Start out with a question — it gets the mental gears turning. By adding some music to the video summary, you can boost the emotional engagement and make it feel more serious, exciting, relaxing, etc. By recording your summary one short sentence at a time, you can make it easier for presenters to remember their lines. You can then edit in a title slide to show a change in topic for each point. Pretend you are talking to a friend. By using your normal tone of voice and speaking cadence, you’ll come across as more authentic and engaging. If you just summarize each point into a phrase on a cheat sheet (rather than memorizing sentences), it’s easier to sound like you are speaking from the heart — and speaking from the freshness of the topic you just spent an hour talking about. The trick is to keep it short. Put yourself in the audience’s position (content marketing 101!) and imagine what you would want to know and how you would like that information to be summarized if you were short on time. To shoot the summary, I’d suggest finding a quiet, well-lit place where the presenter can talk to the camera. Put the camera (or phone) on a tripod to keep the image steady, and help the presenter to relax and get “in the zone.” If necessary, you can prompt them from a cheat sheet with the main topics listed. After you have your footage, you’ll probably want to edit it down using iMovie, Final Cut Pro, Final Cut Express, Premiere, or some other video editing application. Add whatever other assets you feel will enhance the brand story, such as music, graphics, photos, or other elements that may make the content more easy to absorb and enjoy. Once you have your final video exported and ready to go, you’ll need a place to post it as your online content. Potential video hosting sites include YouTube, Vimeo, or even white label services like Brightcove. If you are doing webinars now, you are sitting on a content goldmine. With a little effort you can create more digestible summaries. These summaries will help your busy audience members to absorb your key messages. These videos will boost your visibility online via search engines, social media and email. You can stand out and widen the scope of whom you are reaching. For more great ideas, insights, and examples of killer online video content, read Epic Content Marketing, by Joe Pulizzi.